The Ten of Disks. Wealth. Material Success. Performance. Establishment. Restlessness. Jealousy. Permanence. Greed. Boredom. Dissatisfcation. Having it All. The Futility of Having it All. The Ten of Disks corresponds to the Sefirot of Malkuth: Reality, the Root, the Sum, and the Origin. The Ten of Disks represents what happens when the energy of practicality and the material world interacts with… reality and the material world. As such, as these two ideas are harmonious with each other, the Ten of Disks is more positive than the other three Tens (Oppression, Satiety, and Ruin). 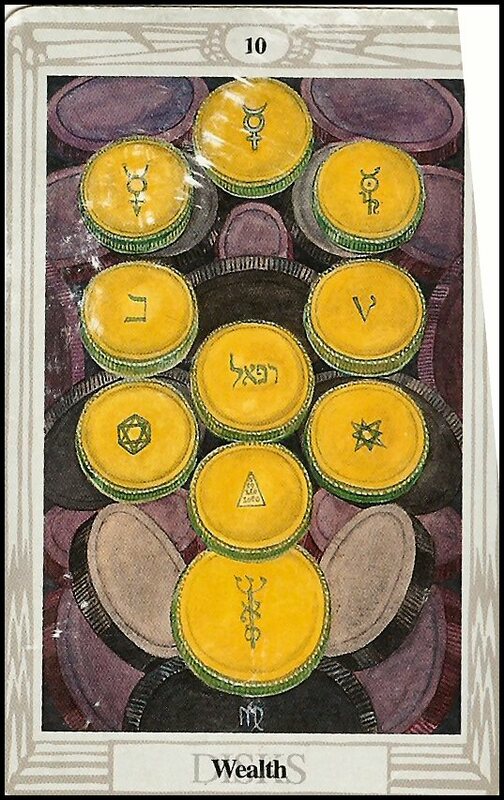 The Ten of Disks represents what happens when someone filled with practical wisdom, prudence, power, and the ability to work with others and to shift and change with the times lives and interacts with reality. This card represents the final culmination of the Suit of Disks when applied to reality, and it results in Wealth for the exemplar of Disks. They havePerformed their roles well and been rewarded for it; even if their heart isn’t in their Performance. They have had great Material Success, and have been able toEstablish themselves and their descendants as important. In this sense, the idea of Malkuth as being about rebirth becomes apparent as well; passing on one’s wealth to one’s children starts the cycle of material gain again, keeping the energy of Disks alive. This card, then, represents Having it All, but also represents the negative consequences of it as well. You may have everything, but others may beResentful of it, or Jealous. You may not be able to stop your desire to accumulate things, and may become Greedy or perhaps Restless and Dissatisfied; you have had Material Success, yes, but what about spiritual, emotional, intellectual, and purposeful fulfillment? In this way, this card also represents the Futility of Having it All; this card serves as a reminder that there is more to the world than the material.